And that makes five! 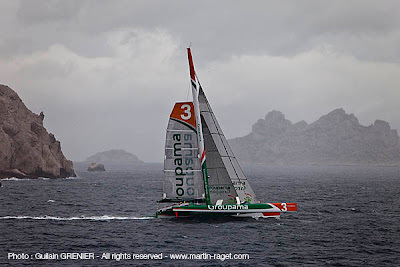 Franck Cammas and his crew have bagged the first record of their 2009 campaign and the fifth since the 105 foot trimaran saw the light of day in June 2006. Setting out from Marseilles on Friday 15th May at 0719 hours UT in a bid to beat the time set by Bruno Peyron in 2004 between Marseilles and Carthage, Groupama 3 crossed the finish line situated abeam of the Ras Quartajamah lighthouse on Cap Carthage, this Saturday 16th May at 00h 27' 23'' (UT). After 17 hours 08 minutes and 23 seconds and in contact with Sylvain Mondon from Météo France, the crew of the maxi trimaran managed to get the very best out of the wind on offer and can now be satisfied with the work they've accomplished. (Course time subject to approval from the WSSRC). A year and a half after their capsize during the Jules Verne Trophy attempt, Franck and his men have snatched a fifth reference time, improving on the previous record of 17 hours 56 minutes and 33 seconds, by 48 minutes and 10 seconds. Groupama 3 covered the 458 miles separating Marseilles from Carthage at an average speed of 26.72 knots, compared with an average of 25.53 knots for Orange II. Franck Cammas just minutes after crossing the finish line: "We had a very good first section of the course with peaks of speed reaching in excess of 42 knots. However, the final section was more difficult with some lighter winds than forecast, which were very variable in terms of direction. It was a feisty passage as the seas were short and breaking but Groupama 3 behaved very well. We didn't break a thing and the crew was fantastic. We'll arrive in Hammamet in a few hours' time with a fifth record to add to our list of wins. It augurs well for the next stage in the programme as Groupama 3 is really quick".